Incoming Leesburg Lions Club President Jay Newland and organizer Angel Greenlee are shown at the Leesburg Fall Fest. The Leesburg Fall Fest continues Saturday, Sept. 29 in the parking lot of the Leesburg firehouse at 200 South St., with a car show, gymnastics and an outdoor concert with the Southern Boys opening for Sean Poole and Hickory Lane. 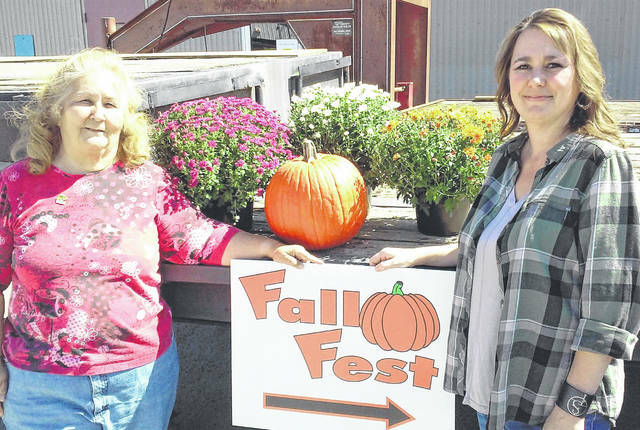 Despite suffering a heart attack earlier this summer, Fall Fest organizer Angel Greenlee is still involved with the event, and told The Times-Gazette there is something for the entire family. Greenlee said that Poole’s latest CD release will be available at the Fall Fest, and that he is raffling off an autographed Fender Squier guitar, with the winner to be announced Saturday night. Although Greenlee has been in the forefront of the Leesburg Fall Fest for the past few years, her health concerns have forced her to hand off more of the responsibility to incoming Leesburg Lions Club President Jay Newland. But that doesn’t dim her enthusiasm in promoting the annual Leesburg event. Kenneth Woleab is also with the Leesburg Lions Club and came to appreciate the hard work that women like Greenlee and Newland put into the event, when his own wife broke her arm this past year. Another of the women working hard to make the Leesburg Fall Fest a success is Cinnamon Dean, one of the vendors who is a portrait photographer from Hillsboro, but went to school in Leesburg. The Highland County native just returned from living for a year in New York since her husband was a military policeman in the Army. The Leesburg Fall Fest will open at 10 a.m. Saturday with a gymnastics show from 11:30 a.m. to noon, followed by karaoke from noon to 2 p.m., a car show from noon to 4 p.m., the Southern Boys at 4 p.m. and Sean Poole and Hickory Lane wrapping up this year’s festival with an outdoor concert from 7-100 p.m.
https://www.timesgazette.com/wp-content/uploads/sites/33/2018/09/web1_Leesburg-Fall-Fest-1.jpgIncoming Leesburg Lions Club President Jay Newland and organizer Angel Greenlee are shown at the Leesburg Fall Fest.